At this point no one knows if Apple plans on launching its iCloud cloud services product at WWDC or if it is just going to announce that it is on its way. 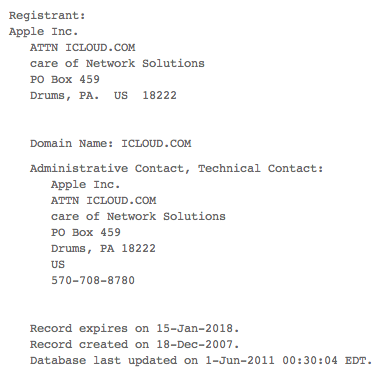 But, with the news, reported Wednesday by Macrumors, that it has updated the domain registration for iCloud.com, Apple is set to do so if it wishes. Until today, the registration still pointed to Xcerion, the previous owner of the iCloud product, now known as CloudMe. The iCloud domain was reportedly purchased by Apple for $4.5 million, with Xcerion re-branding their product on April 5th. Now the registration information for the domain points to Apple as the owner. This allows it to control the domain fully, including pointing it at any site it needs to, including an iCloud launch page that it has no doubt already been working on. This poises Apple to launch iCloud at WWDC next week. Any launch would be dependent on how far along the service is of course, but if it is nearing completion, this would allow Apple to launch web components of the service immediately. Apple is also going to be talking about iOS 5, the latest version of their mobile OS, and OS X Lion, the newest edition of its desktop software. Both products have been rumored to have deep integration with Apple’s new cloud services. If an iOS 5 beta is released to developers at WWDC, having a cloud service up and running would allow them to begin testing and integrating those features into their apps immediately. We’ll know for sure on Monday, when Steve Jobs takes the stage at the WWDC keynote.